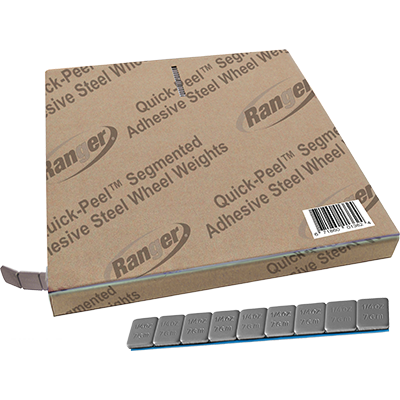 These silver Quick-Peel™ adhesive steel wheel weights are an effective and environmentally friendly way to quickly balance wheels using as little weight as possible. Many states are banning the use of lead wheel weights. Ranger steel weights come in black and silver. Our Stick-On Steel Wheel Weights offer the best overall fit, as well as the most reliable and cost-effective choice. Ranger steel wheel weights are designed to have less impact on the environment and are corrosion resistant. Our .25 oz. wheel weights are perfectly sized and weighted for most wheel balancing applications, and when paired with a Ranger wheel balancer, you’ll never use more weight than necessary for the job. Our adhesive is extra-sticky, lessening the chance of the weight falling off the wheel and improving your level of customer service. Customers will know the quality difference when you service their vehicle with Ranger wheel weights.